Our family of small chemical containers is the ideal package for a variety of chemical and pharmaceutical applications. Stainless steel containers are durable and reusable, they maintain product integrity, and promote handling safety. Whether your application is corrosives, poisons, or flammable liquids, we can design a container system to meet your specific needs. Many designs UN approved with 15 psi m.a.w.p. 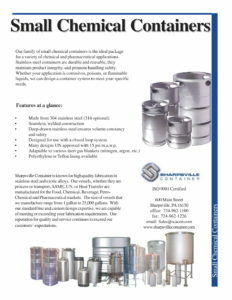 Sharpsville Container is known for high-quality fabrication in stainless steel and exotic alloys. Our vessels, whether they are process or transport, ASME, UN, or Heat Transfer are manufactured specifically for the chemical market. The size of vessels we manufacture ranges from 1 gallon to 25,000 gallons. With our standard line and custom design expertise, we are capable of meeting or exceeding your fabrication requirements. Our reputation for quality and services continues to exceed our customers’ expectations. Contact us today or request a quote to get started! We’d love to fabricate a container to meet your needs.